Office for rent in the very center of Saint-Petersburg, near the Palace Square and Winter Palace, the Imperial heart of the city. The Best Location you can get in the Saint-Pet. : the "Golden Triangle" of the city. The building is located in front of the "Nothern Capital" business center (the central residence of Raiffeisen bank) on Volynsky lane, 2 (Moika embankment, 32/2). 5 minutes afoot from the central metro station "Nevsky prospect" ("Kanal Griboedova"). 40 m from Moika embankment with a lot of summer moorings for houseboats - very lovely place for tourists. 250 m from Nevsky prospect – the highstreet of the city. The office is a former flat, renovated and officially registered for the commercial purposes. The flat consists of two rooms: 20 m2 and 30 m2, kitchen (8 m2), toilet, bathroom, hall and lobby. The office is offered for rent without any middlemen, comissions, etc., directly by the owner of the property. If you rent single room - kitchen, hall and WC are shared with the other tenant. You can start renting the 30 m2 room immediately. As for the two other variants, 20 m2 and the whole office (85 m2) - start of renting is available 1 month later the contract signing, because the 20 m2 room is rented now and under the contract conditions we have to give to current tenant 1 month to complete the relationship. So in these cases we need 1 month rate (30,000 or 70,000 RUR) prepayment in advance right after signing the contract. And then, 1 month later, you can start using the rented room (or whole office). The office to let is located on the first (ground) floor. Official address: Volynsky lane ("pereulok"), 2. Alternative address of the building: Moika embankment, 32. The entrance to the building is from Volynsky lane, see the map. The rental prices indicated above include all communal bills (electricity, water, gaz). There are one landing telephone line (provided by Rostelecom), paid by tenant. Hanging ceiling with embedded daylight lamps. Height: 3,1 m. .
You can find the general plan of the office apartment on the appropriate page. 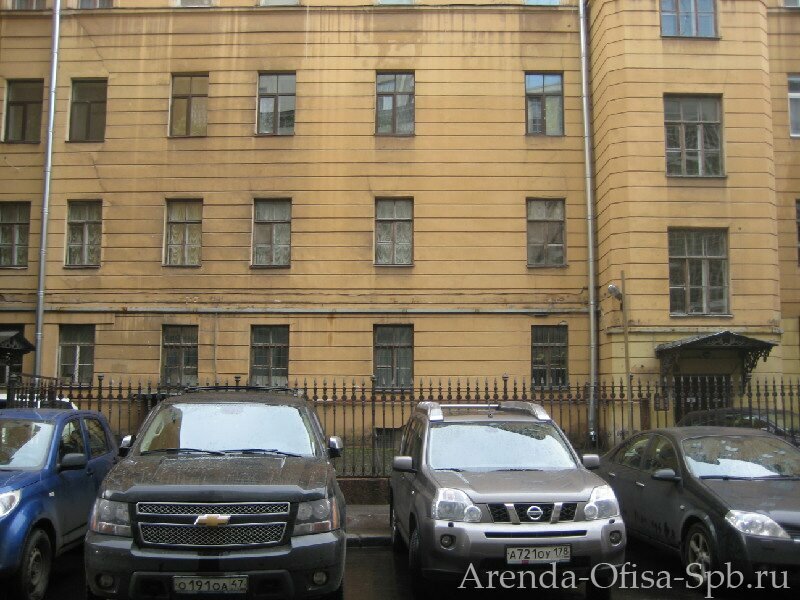 Parking on the curb of Volynsky lane, in front of the entrance to the office building (1). The office's windows are highlighted. Parking is available on the curb of the Volynsky lane, before the office building. There is also chargeable parking inside the Raiffeisen bank building on the other side of the lane.